Sophomore Kiley Gallagher’s first two career goals at New Balance Field could not have come at more crucial moments. Neither could her Patriot League winning assist. The midfielder tallied the first goal in Boston University’s Patriot League semifinal win Friday, and followed it up with the Terriers (13-7, 6-0 Patriot League) first goal Sunday to tie the title game. She then assisted on the conference-winning goal. BU was victorious 2-1 over the Bucknell Bison (10-10, 3-3 Patriot League) who found themselves in the championship game after upsetting Patriot League No. 2 American University. 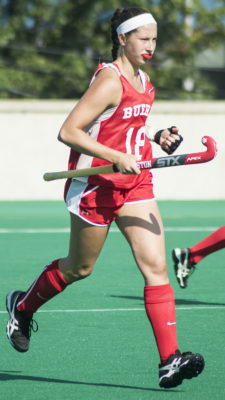 Gallagher made her first mark after the Terriers sixth corner chance of the title game. Senior Kali Shumock inserted to junior Ally Hammel and surprisingly, the anchor of the corner unit dropped off a pass to the short option. Gallagher inched her way towards the net and zipped a shot past Bucknell goalkeeper Emily Finn into the back of the cage. BU had tried a similar corner formation earlier in the game, but could not prevail. Starr stuck with her gut, and she said she wanted her team to execute a more complex corner set. Gallagher then had her hand in the game-winning goal, intercepting a Bucknell pass in the Terrier offensive zone, slicing through the defense and feeding senior Allie Renzi for an elusive lifting shot with 2:25 left. BU limited conference opponents to less than one goal a game, outscoring Patriot League foes 26-6 and extended their shutout mark to 174:58 before conceding the game’s first goal. Bucknell scored first when freshman Leah Fogelsanger redirected a shot by sophomore Chloe Poltonavage just inside the left post at 9:53. Finn made six saves to dishearten the Eagles in the semifinal victory, limiting an American attack that featured the league’s Offensive Player and Rookie of the Year. Gallagher said that her team is a major reason for her recent success. Starr enjoyed her team’s second chance against the Bison on a bigger stage much more, thanks to strong play from Gallagher.